This story starts on February 7, 1987. A friend of my dad's had a cockatiel that was to aggressive to be around other birds, due to mistreatment when he was young. 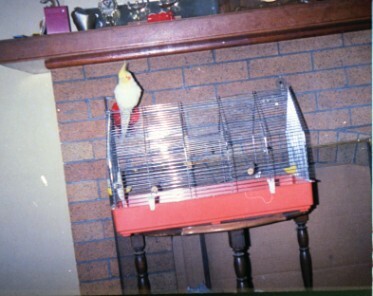 Because of his attitude problems, no one wanted to adopt this bird and he was going to be euthanized. But my dad had a soft spot for animals, and so he agreed to take the cockatiel home. 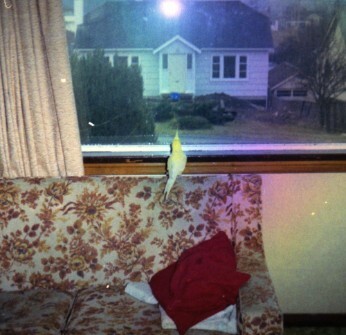 That morning when I woke up I head chirping in an upstairs guest bedroom, and was introduced to Goldie for the first time. And in spite of his past, Goldie fit in right away. We gave him free run of the house, so most days he would be sitting on the curtains and looking down on all of us. Or if we were sitting on the sofa, he would fly down and beg for a one-finger scratch of his head. And in spite of his past, Goldie fit in right away. We gave him free run of the house, so most days he would be sitting on the curtains and looking down on all of us. Or if we were sitting on the sofa, he would fly down and beg for a one-finger scratch of his head or just sit and look out the window. Not long after he moved in, he managed an escape. The front door was opened for a brief moment, and flew as quick as possible out into the big world outside. He came back safe and healthy a couple of weeks later, but in that time he got to experience true freedom. And in hindsight I am glad that at least once in his life he had no constraints on him - I will always remember watching him fly free in the blue skies high above. 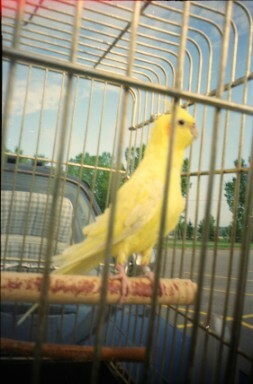 Then in 1998 when my dad almost died from a stroke, Goldie was a comfort to us (and later to my dad as well). 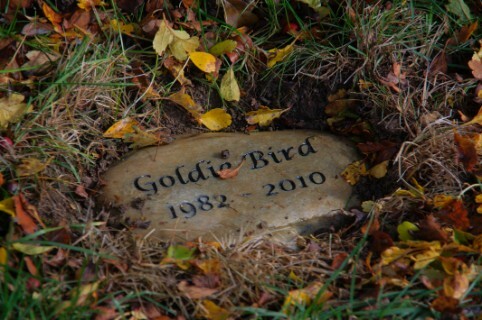 No matter how rough things got, we could still talk to Goldie. 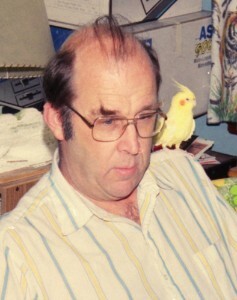 After my dad returned home from hospital, he would spend his days sitting in his chair right beside Goldie's cage and together they would watch TV and grump. On March 31,2007 we had another interesting time. By this point Goldie was getting older - in fact we had had him 20 years and cockatiels only live 17 - and so he didn't fly very much anymore. This one afternoon he decided to try, and crashed into the piano and fell on the floor. He came walking back to his cage, dusting himself off, and giving my dad a great laugh. A few hours later my dad was rushed to hospital and never returned home again - laughing at Goldie was one of his last memories of home. After my dad died, Goldie continued to sit next to his chair and would watch TV. He especially like the Weather Channel for it quiet music and soft voices that kept him company when he was home alone. Fifteen minutes later he had passed away in his sleep.